Don’t be a follower of your analogy and opinion. Every zahir you see cannot be without a batin. Listen to the call of the Da‘wah from an authorized Da‘i. You will become the accepted one. You will become alive and your heart will be enlightened. The word da‘i (dā‘ī) means “caller”, “summoner”, or “inviter” [not “missionary”] and comes from the Arabic verb da‘ā, which means “to summon”, “to invite”, “to call”, “to call upon”, etc. The original name of the Shia Ismaili path (tariqah) of Islam in the eighth and ninth century was Da‘wat al-Haqq (Summons of Truth) and al-Da‘wah al-Hadiyya (Rightly-Guided Summons). The da‘wah here refers to the act of inviting people to the recognition of the absolute oneness of God (tawhid) through the guidance and recognition of the Imam of the Time. In fact, the Ismailis did not call their religion ‘Ismailism’. This was a name given to them by the early heresiographers, notable al-Nawbakhti and al-Qummi. They referred to themselves simply as the Faith of Truth (din al-haqq) or the Summons to the Truth (da‘wat al-haqq). The Qur’an refers to the concept of God’s Da‘wah (Summons, Calling, Invitation) on numerous occasions. God “summons” humankind to Himself: “And God summons to the Abode of Peace and leads whom He wills on the Straight Path” (Qur’an 10:25). On God’s behalf, the Prophets “call” people to Divine guidance and Prophet Muhammad is instructed to “invite to the path of your Lord with wisdom and beautiful discourse” (Qur’an 16:125). In this context, the Qur’ān (33:36) refers to the Prophet as a Dā‘ī (inviter) to God by His permission and urges believers to “respond” when the Prophet summons (da‘ā) them to what gives spiritual life (Qur’an 8:24). According to the Qur’an, God will issue a “summons” on the Day of Judgment and this Summons of God will reach human beings through the Imam of the Time. And among His Signs is this: the heaven and earth stand by His Command: then when He calls you, by a single summons (da‘wah), lo! You will emerge from the earth. On the Day when We will summon (nada‘u) all people through their Imam. O ye who believe! Respond (istajibu) to God and His Messenger when he summons you to that which gives you life. The Imam Ma‘add [al-Mu‘izz] summons to the tawhid of God, the Absolute. Our lord the Commander of the Faithful (Imam ‘Ali) said: “Da‘is in religion distinguish between doubt and certainty.” Distinguishing between doubt and certainty is to separate truth from falsehood…The da‘i must know the difference between truth and falsehood, so he can distinguish one from the other. Image from a post-Alamut Nizari Ismaili Treatise, rendered by Shafique N. Virani in The Ismailis in the Middle Ages (2007). Throughout history, individuals have “responded” to the Imam’s “Summons” (Da‘wah) to the recognition of God – by entering into a bay‘ah (spiritual covenant) with the Imam. As part of this covenant, the Imam guides them spiritually toward the gnosis of God in this world and the next world and also helps safeguard their material quality of life. Those who give their bay‘ah to the Imam become a part of the Imam’s Summons, becoming his spiritual children, and also play their own part in calling and inviting others to the recognition of the Imam. In the pre-modern period of Ismaili history, the Imam’s Summons was executed through a formal esoteric teaching institution called the “Ismaili Da‘wah”. Those Ismailis who were of sufficient spiritual, moral, and intellectual stature became da‘is (“summoners”) and instructed other Ismailis in knowledge and practice on behalf of the Imam of the Time. The Ismaili Da‘wah was self-consciously the instrument through which true religion – valid law and doctrine, proper belief and action, correct science and knowledge of the universe, rightful loyalty to God and His agent for human affairs, appropriate appreciation for the difference between appearance and reality, between the purely physical and the truly spiritual – was made known to mankind in general and to believers in particular. We raise in ranks (darajat) whom We please; and over every possessor of knowledge is a possessor of knowledge. It is God who has created seven heavens and of the earth, the like of them. The Command descends among them so you may know that God is powerful over all things and that God has encompassed all things in knowledge. The above seven Da‘wah Ranks are called the “Hudud al-Din” (the Ranks of Faith) in Ismaili terminology. Together, these seven Dignitaries are the “Seven Heavens” and “Seven Earths” mentioned in the Qur’an. This means that each Rank from the Imam to the Mustajib is a “Heaven” for the rank immediately below; likewise, each Rank from the Bab to the Mustajib to the person outside the Da‘wah Hierarchy is an “Earth” for the Rank immediately above it. For example, the Bab is an “Earth” compared to the Imam and a “Heaven” compared to the Hujjah. The Mustajib is an “Earth” compared to the Ma’dhun Asghar and a “Heaven” compared to those outside the Ismaili Da‘wah. The above Ismaili Da‘wah Ranks exist and are active in every age and time – both before Prophet Muhammad and after him. Prophets of past periods used to receive spiritual training and initiation into prophethood from the dignitaries of the Da‘wah. For example, Prophet Muhammad himself was spiritually initiated by Imam Abu Talib and his Bab, Hazrat Khadijah al-Kubra; Prophet Adam was spiritually initiated by Imam Hunayd. Prophet Jesus was spiritually initiated by Mary, the Bab of the Imam Khuzaymah. Prophet Abraham was spiritually initiated by Imam Malik al-Salam (called Melchizedek in the Bible). Prophethood and prophetic ascent are linked to the gradual perfection of the human being that takes place initially with the training the “Calling” (da‘wah) provides in each prophetic cycle… The “Calling” of each epoch, like the “ranks of religion”, thereby provides the necessary training (tarbiyyah) not least for individual practitioners but for the prophets as well… Even the prophets are not exempt from the necessary training that the “Calling” provides in each cycle of prophetic history… The apparent Calling is paired with the hidden Calling for the purpose of explanation and facilitation. During the period of Prophethood, the Hereditary Imams came from the lineage of Ishmael, son of Abraham, and continued through the line of Abu Talib during the lifetime of Prophet Muhammad. At the same time, certain Prophets spiritually ascended to the rank of Imam and functioned as Entrusted Imams – executing the function and authority of the Imamat while the Permanent Hereditary Imam was not directly accessible. In general, after Abraham and up to Prophet Muhammad, the Entrusted Imams came from the progeny of Isaac, son of Abraham. Examples of Prophets who were also Entrusted Imams include: Adam, Enoch, Noah, Hud, Salih, Abraham, Isaac, Jacob, Joseph, Jethro, Moses, Aaron, Joshua, David, Solomon, Imran, Zacharia, John the Baptist, Jesus, James brother of Jesus, and Prophet Muhammad. 1 Bab is the present Imam’s son and successor; for example, Imam Sultan Muhammad Shah was the Bab during the lifetime of his father Imam Aga ‘Ali Shah; Mawlana Hazar Imam was the Bab of Imam Sultan Muhammad Shah. Our Lord, the Commander of the Faithful, is like the Sun whose light is bright and blinding such that, if it were not followed by the Moon to moderate and cool its effects, no plant could develop properly on earth and the heat would overpower it. The four Hujjahs [Babs] who are never separate from the [spiritual] presence of the Imam (ḥaḍrat-i Imam): they take knowledge from him and give it to the people. People cannot reach a rank in which they can receive a word from the Imam without the intermediary of one of those four Hujjahs [Babs]. Below the rank of Bab is the rank of Hujjah (“Proof” or “Argument”). The Hujjah is the chief Da‘i over a network of Da‘is in a region, who uses “proofs and arguments” to establish the Imamat of the Imam and lead others to the inner recognition (ma‘rifah) of the Imam by providing the knowledge of philosophy, theology, and the ta’wil (inner meaning) of what is found in the Qur’an and practiced in ritual and law. Each Hujjah is in charge of conducting the Summons in a particular region (jazirah) of the world or for an ethnic-tribal group. In the classical period, there were said to be 12 geographical/ethnic regions (per the Ta’wil al-Da’a’im al-Islam of Qadi al-Nu’man): Rūm (Byzantium); Daylam (Persia); Sind (Modern day Pakistan); Hind (India); Ṣīn (China); the lands of the Arabs; Nubians, Khazars, Ṣaqāliba (Slavs); Berbers; Zanj (Sub-Saharan Africa); Abyssinians (Ḥabash). In each region (jazirah) there is one “Hujjah of the Day” and one “Hujjah of the Night” leading the Ismaili Summons. The Hujjah of the Day is a Hujjah who is outwardly Ismaili and known to the community while the Hujjah of the Night works in a hidden and anonymous way. Thus, there are 12 Pairs of Hujjahs – corresponding to the number of 12 Months in the year. Understand that for each Imam there are twelve visible diurnal Hujjahs and twelve concealed and hidden nocturnal Hujjahs…they are the veil of the Imam and are his mouthpieces and gateways, his deputies and the messengers from him to the Da‘is, who in turn convey the message to the believers. The Hujjahs derive their knowledge both from the rigorous study and reflection on books/literature and from the spiritual inspiration of the Imam; they convey this knowledge to others through verbal and written teaching. In other words, the Hujjah does not depend only on “book learning” for his knowledge; he is inspired (mu’ayyad) by the Imam in making intellectual discoveries. The Imam conveys knowledge, guidance, and ta’wil to his Hujjahs through his luminous inspiration (nurani ta’yid) and spiritual imaginal vision (khayal). Practically speaking, the Hujjah does not need to physically learn from another person and his teachings do not require formal “approval” by a council or a committee. For this reason, the writings of many Hujjahs like Sijistani, Kirmani, or Nasir-i Khusraw often mention that whatever they write in their books is from the Imam’s ta’yid. For example, Sayyidna Nasir-i Khusraw, the Hujjah of Khurasan, wrote at the end of his book, The Face of Religion, that “whatever is good in this book we have shown by the spiritual inspiration (ta’yid) of the lord of the time” (The Face of Religion, Chapter 51). 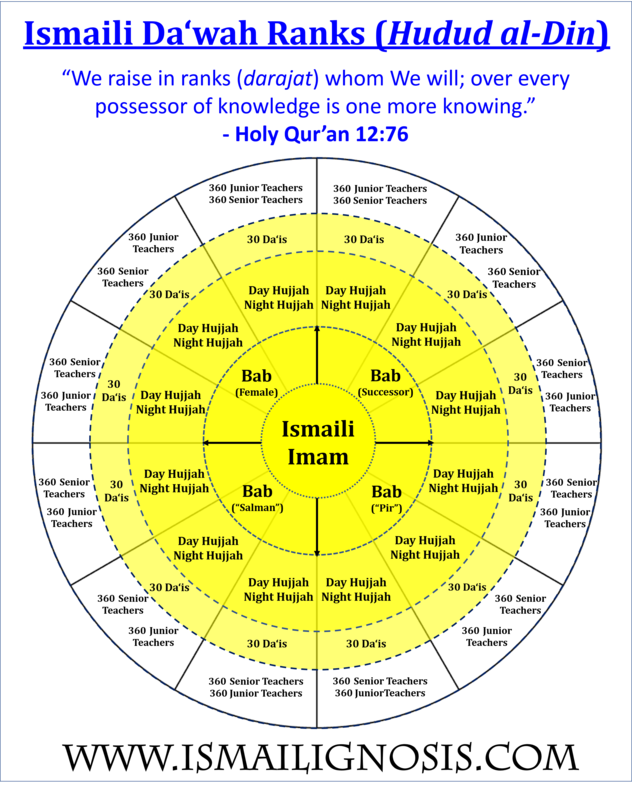 In total, the 4 Babs and 24 Hujjahs total to 28 Hujjahs under the Imam: every Hujjah receives knowledge and ta’wil (esoteric interpretation) from the Imam through spiritual assistance (ta’yid) and spiritual imagination (khayal) as opposed to verbal or written instruction (ta’lim). The number 28 is rich in symbolism and corresponds to the number of Lunar Mansions (stations) and 28 Days is the length of the Lunar Cycle. Thus, the Babs and Hujjahs together are symbolically and spiritually in the rank of the Moon as compared to the Imam who is the Sun. And the Moon – We have measured for her stations till she returns like the old (and withered) lower part of a date-stalk. For just as the body of the Moon is in itself dark but illuminated by the Sun, taking the Sun’s place in his absence, and lighting up the Earth in proportion to the amount of light that it has been capable of obtaining from the Sun, so the soul of the supreme Hujjah, which by itself knows nothing and is nothing, is illumined by the effulgent radiation of the divine assistance (ta’yid) from the Imam… By virtue of his capacity to receive the grace of the lights of knowledge (fayd-i anwar-i ‘ilm) and according to the measure of his aptitude, he enlightens people about the Imam, showing the way to him. Under the Hujjah is a rank specifically called the Da‘i. In general, every rank from the Bab to the Ma’dhun is an Ismaili da‘i, but the specific term here applies to the rank under the Hujjah. The Da‘i gains knowledge of ta’wil (esoteric interpretation) from the Imam’s Hujjah through learning, reading, and studying; he then passes on and teaches his knowledge to other Ismailis through verbal teaching and writing. Thus, the Hujjah learns from the Imam through inspiration (ta’yid) and passes it on through instruction (ta‘lim); while, the Da‘i learns from the Hujjah through instruction (ta‘lim) and also passes on the knowledge through instruction (ta‘lim). For each of the 12 pairs of Hujjahs, there are 30 Da‘is – just like there are about 30 days in each of the 12 Months of the Lunar Calendar, for a total of 360 Da‘is. According to the teachings of Imam Sultan Muhammad Shah, there are 313 True Believers (haqiqati mu’min) in the world at all times – these 313 are at the rank of Da‘i, and their number is completed by 47 more Da‘is, for the total of 360. 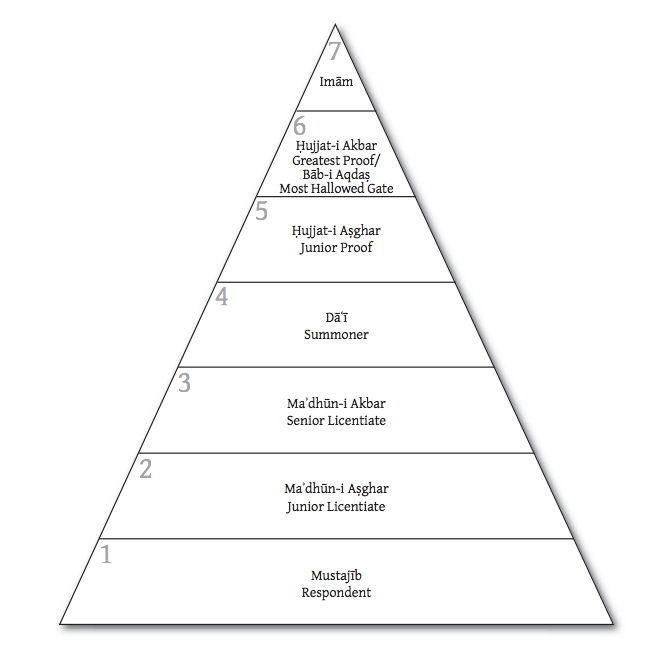 Under the rank of Da‘i, there are lower ranks called Ma’dhun Akbar (“senior teacher”) / Mu‘allim (“instructor”) and Ma’dhun Asghar (“junior teacher”)/ Mukasir (“questioner”). For each Da‘i, there are 24 Ma’dhuns — 12 Ma’dhun Akbar and 12 Ma’dhun Asghar, which correspond to 12 Hours of the Day and 12 Hours of the Night. The role of the Ma’dhun Asghar / Mukasir (“questioner”) was to engage people, ask questions, and find a suitable person who was seeking the inner truths of religion. He would often do this by mixing with people, making statements, and asking questions that cause them to reflect on their beliefs. If such a person wanted to learn more and find answers, he would become a Mustajib (respondent); after some initial conversation with the Ma’dhun Asghar / Mukasir, the Mustajib would be taken to the Ma’dhun Akbar / Mu‘allim and then receive further instructions and answers to his questions. Once the Mustajib was ready, the Ma’dhun Akbar would accept his bay‘ah on behalf of the Imam and his journey through the Ismaili Da‘wah toward the recognition of the Imam would begin. God has based His religion (din) on the likeness of His creation (khalq), so that they might find His creation a sign indicating His religion, and His religion a sign indicating His oneness. We will seek to demonstrate that spiritual insight and worldly knowledge are not separate or opposing realms, but that they must always nourish one another, and that the World of Faith and the material world are the dual responsibilities of humankind. Just as the Sun, Moon, and Stars give light to the Natural World (dunya), in the World of Faith, the Imam is the Sun, the Babs are the Moon, the 12 pairs of Hujjahs are the 12 Constellations of the Zodiac and their Da‘is and Ma’dhuns are the Stars; these religious dignitaries (hudud al-din) convey the light of knowledge to the World of Faith (din). Similarly, just as the “physical time” of the material world is measured through years, seasons, months, days, and hours, in the “spiritual time” of the World of Faith, the Imam is the Year, the 4 Babs are the 4 Seasons, the 12 pairs of Hujjahs are the 12 Months, the 360 Da‘is are the 30 Days of each Month, the 12 Ma’dhun Akbar are the 12 Hours of Night and the 12 Ma’dhun Asghar are the 12 Hours of the Day. Along the same lines, in the World of Faith, the Imam is the Heaven, the 4 Babs are the Elements of the Earth, the Hujjahs are the Mountains, the Da‘is are Rivers and Streams, and the Believers are the Vegetation that grows. As the Imam, I think it would be important to try to have been an interpreter of the faith which enabled people to continue to look to a Spiritual World and a World of Faith, which is not only a material world. I feel very, very strongly about that. A da‘i is not allowed to make appointments to the da‘wah to fulfill some service or satisfy a claim of favour, or for affection, relationship, friendship, intercession, or concern, or for some gain, or to avoid some harm, or out of shame, modesty, or fear. All of those things lead away from religion, from justice, from security and from good will toward God and the Messenger… The da‘i should not attempt to dismiss a da‘i who is upright in the da‘wah on account of something he had done that personally angers him or because of a lack of service, but rather he will dismiss the man solely for disloyalty in religious matters. The da‘i is first and foremost somebody who has self-discipline – they are those who are regular in their religious obligations; they live life without engaging in bad or evil habits like drinking alcoholic beverages; they act righteously towards others, are selfless, and are well-mannered. The da‘i is patient with everyone and never becomes angry with those who request her or his help. The da‘i is also never arrogant or miserly; they are generous and kind with those who request their help and never discourage those who seek them – they only encourage and console them. The qualifications to be a da‘i do not only include following ethical principles – it is also a matter of knowledge and intellect. A da‘i must be firmly learned in the Root-Principles of Faith (usul al-din), as the core mission of the da‘i is to educate and teach about the Imam and the doctrines of religion. They have knowledge of both exoteric and esoteric principles of the Ismaili Faith, of the history of the Imams, and also of all of the other Muslim communities, religions, and cultures of the world. The da‘i is, thus, somebody who loves knowledge. They are constantly seeking out knowledge and sharing that knowledge with others. The doors of a da‘i are therefore always open and they never dismiss those who request their help. Through their instruction of religious knowledge and conveyance of the Imam’s blessings, they seek only to educate, unify, and bring love and happiness to their community. The da‘i is additionally skilled in argumentation and debate. Being caretakers of religious knowledge, they are always ready to defend and refute those who seek to defile or reject the Imams. Da‘is [who summon] to the truth – those who uphold righteousness – do not relish the vanities of this world or thirst in their hearts for political leadership. All who hunger for this world and aspire after positions of authority go astray from the true path, having lost their way. The subjects that comprise the sciences of religion…they are too numerous to be comprehended by any single individual other than the Imam, or for one group only to safeguard them. Accordingly, he designated for this purpose a large number of individuals below the office of the Imam who are to collaborate amongst themselves in the pursuit of all the sciences and in their preservation and safekeeping. Such persons include the twelve Hujjahs, each of whom learns from those righteous Imams who were appointed by God to assume the reins of guidance about the most obscure matters, both the hidden and obvious aspects, commensurate with their own abilities and strengths in understanding and comprehension. In this they are to provide guidance for others similar to the way the Imams confer enlightenment and knowledge. Religion is in them like a single individual who is composed of its parts and they are to him like the senses by means of which things are perceived. If some item escapes one of them, another will perceive it without the perception of the second implying any fault in the first that failed to perceive it or any other of the senses… If one of the senses fails to perceive some item in the realm of the physical world, it will not escape the other which will instead cooperate to assist it in fulfilling the duty of religion and confirming the intention of the Lord of the universe. I too used to be dead, and he gave me life; I was ignorant, and he gave me knowledge. I am not the first person to be ignorant, so that I attained knowledge before everyone else; nor am I the last one to be ignorant, so that the process of (spiritual) teaching will come to an end. Therefore it is only right for me, because of my gratitude for this blessing, to pass on this (divine) trust (4:58; 33:72, etc.) to those who come after me, just as those who preceded me have handed it down to me. Ibn Hawshab, known as Mansur al-Yaman (“the victorious one of Yemen”), was originally a follower of the Twelver Shi‘a imam, Hasan al-Askari; when this imam died in 874 without leaving a son or successor, his followers were thrown into chaos; at this time, Mansur al-Yaman was sad and searching for the truth of the matter of Imamat. It is reported that by a stroke of luck, Mansur al-Yaman met the Ismaili Imam, who was living undercover at the time, near the bank of a river. Mansur al-Yaman asked some questions to the Imam, who provided answers in a way he had never heard before; the Imam then left and Mansur spent a great deal of time searching for him. Eventually he found the Imam again and after some more discussion, Mansur al-Yaman gave his bay‘ah to the Imam and joined the Ismali Da‘wah. The Imam sent Mansur al-Yaman to Yemen to lead the da‘wah and prepare the ground for the eventual Fatimid state. Mansur al-Yaman proceeded to Yemen and was very successful in establishing an Ismaili stronghold in the area. He was also responsible for training many Ismaili da‘is and sending them out to other regions. Unfortunately, some of Mansur’s subordinate da‘is and one of his sons betrayed the Imam’s cause and eventually took over the seat of power. One of Mansur al-Yaman’s sons, Ja‘far, stayed loyal to the Imam and emigrated to North Africa during the Imamat of al-Qa’im. Ja‘far b. Mansur ascended the ranks of the Da‘wah: he became the Bab of Imam al-Mu‘izz and remained close to the Imam until his death. Ja‘far b. Mansur was a master of ta’wil (esoteric interpretation) and wrote numerous works, including: The Master and the Disciple (kitab al-‘alim wa l-ghulam), the Book of Unveiling (kitab al-kashf), the Esoteric Interpretation of Purification Offering (ta’wil al-zakat), the Secrets of the Prophets (sara’ir wa asrar al-nutuqa). A famous story from the time of Imam al-Mu‘izz demonstrates the spiritual status of Ja‘far b. Mansur al-Yaman. There was one time when the Da‘i Qadi al-Nu‘man fell ill; Nu‘man worked closely with the Imam, so many Ismaili da‘is and politicians came to visit him during his sickness – except one person – Ja‘far. After he recovered, Nu‘man complained about this to the Imam. The Imam then produced a book and asked Nu‘man the name of its author, Nu‘man examined the book’s contents and replied that nobody except the Imam could have written such a book. The Imam then told him that he was incorrect, for the book had been written by “your Mawla Ja‘far b. Mansur al-Yaman”. Upon hearing this, Nu‘man immediately went to Ja‘far’s house and paid him homage. This shows how the status of the Bab of the Imam was sometimes kept hidden and secret from the rest of the community. No theologian or specialist in disputation or jurisprudence, no merchant, no one desirous was left who did not respond to his summons and seek to draw close to him and make contact with him…Several sessions of debate took place between him and Sa‘id b. al-Haddan and Musa al-Qattan on the Imamat, the elevation of the less excellent, the identity of the sunna, fasting, and maintaining chastity… He used to detain me each day to eat with him, and many were the times I would spend the night with him. One day publicly debating with Sunni theologians, another day composing luminous poetry, and the next day conquering North Africa in the Imam’s name, Abu ‘Abdullah al-Shi‘i was a polymath. The tale of his conquest of the Fatimid territories was memorialized by Qadi al-Nu‘man, Fatimid court historian and luminary, in his chronicle titled Founding the Fatimid State. Abu ‘Abdullah al-Shi‘i was trained for Da‘iship by renowned Hujjah Ibn Hawshab Mansur al-Yaman, having attended his sessions and trained with him for combat. He was then sent to Mecca on pilgrimage where he met some Kutama Berbers and dazzled them with his humility, wisdom, and towering personality. His impact on them was so great that they asked him to join them in North Africa and there he taught them, governed them, inspired them with his immense love and devotion to the Imam of the Time. The alliance formed under the bond of al-Shi‘i’s leadership lasted generations as the Berbers not only formed the mainstay of the army that conquered what became the Fatimid empire but then also continued to form the bulk of the Fatimid army for centuries. Threatened by the growing power that al-Shi‘i was amassing after nearly a decade of living among the tribes-people, opposing Berber tribes tried to confront him militarily. These attempts only served to consolidate and strengthen his position as religious and political leader of the Kutama Berbers. When Aghlabid emir Ibrahim b. Ahmad’s attempts at bribing al-Shi‘i away from the Imam failed, he threatened him with war. The ensuing conflict (from 289/902 – 296/909) saw the Da‘i personally lead the Kutama Berber tribe into numerous battles against armies with far greater numbers and equipment. After having conquered the Aghlabid territories, al-Shi‘i entered the capital city of Raqqada, established political and religious structures and subordinates to run them before hurriedly exiting to rescue Imam al-Mahdi from imprisonment in Sijilmasa. He had never before seen the Imam and the beautiful scene of their first time meeting is incredibly touching as detailed in the memoir, Advent of the Fatimids, written by Fatimid Ismaili Da‘i Ibn al-Haytham laced with allegory and layers of imagery. After his rescue, al-Shi‘i personally escorts the Imam back to the kingdom he had fought for in his name – and delivered it into the hands of the Amir al-Muminin, the Imam al-Mahdi. Soon after al-Shi‘i’s beautiful reunion with the Imam, something went horribly wrong: al-Shi‘i, who had been steadfast and humble in service to the Imam he had never even seen, eventually betrayed the Imam and tried to remove the Imam from power, likely due to the influence and pressure of his power-hungry brother Abu l-‘Abbas, al-Shi‘i’s loss of political leadership, and some disgruntled Berbers. However, despite his ignominious ending, Fatimid Da‘i al-Shi‘i was remembered and commemorated for all his efforts and faith in service to the Imam by the Imam and his fellow Da‘is, who remembered him fondly. The Imam al-Mahdi even recited the funeral prayer over al-Shi‘i’s grave and forgave him. Al-Nuʿmān and a group of dāʿīs came to the Commander of the Faithful, [Imam] al-Muʿizz. They mentioned some invented sayings, doctrines (madhāhib) and opinions, which had caused disagreement among Muslim groups… Then al-Muʿizz mentioned the words of the Messenger of God to them: ‘If deviation occurs in my community (umma), the scholar should manifest his knowledge, or else God’s curse be upon him.’ He turned to al-Qāḍī al-Nuʿmān and said, ‘You are meant by that, O Nuʿmān.’ Then he instructed him to compose the Kitāb al-Daʿāʾim [The Pillars of Islam]; he confirmed its foundations and divided its sections… He (al-Muʿizz) confirmed parts of it, corrected the errors in it and filled the gaps until it was complete. Thus the work emerged as a comprehensive synopsis with utmost precision. That was a miracle of the Commander of the Faithful, al-Muʿizz li-Dīn Allāh which he manifested through his Dāʿī and supporter (walī) al-Nuʿmān b. Muḥammad, explicating the law (sharīʿah) of his forefather Muḥammad. One of the best known Da‘is of the Fatimid era, Qadi al-Nu‘man served Imam al-Mahdi from 312/924 and the next three Imams until his death almost fifty years later. Unlike Nasir-i Khusraw, Hasan-i Sabbah, and Tusi who were converts, Nu‘man was most likely born Ismaili. Qadi al-Nu‘man, like the quintessential Da‘i described in Naysaburi’s code of conduct, was able to take on many roles and was knowledgeable in many areas of Ismailism including Islamic law and ta’wil. He presided over the judiciary as the Chief Judge (qadi al-qudat) and led the organized Da‘wah as Chief Da‘i (an administrative position akin to ITREB Chair) – which included delivering weekly lectures to the Ismaili initiates in the Fatimid palace on various topics. Under the direction and supervision of the Imam al-Mu‘izz (in the above quote), Nu‘man wrote the authoritative Ismaili text on Ismaili law called The Pillars of Islam (da‘a’im al-islam) which became the official legal handbook of the Fatimid State and which Bohra Ismailis still follow to this day. People of Truth and Justice do not permit blind following (taqlid) with regard to root-principles (of faith) such as knowledge of God’s oneness, the matter of Prophethood, and the proof of Imamat. But once God’s oneness, the matter of prophethood, and the matter of Imamat are proven and established, it is thereafter permissible to blindly follow the true, just, and knowledgeable Imam. Abu Hatim al-Razi was the chief Da‘i of Rayy (in Persia), a stronghold for the Ismaili Da‘wah and a region where the Ismaili da‘is were focused on winning the allegiance of the rulers. He is famous for his debate with Abu Bakr al-Razi (Rhazes). The debate was about the usefulness of religion, the need for Prophets, the divine mandate of Prophet Muhammad’s mission, and the divine inspiration of the Qur’an. In the record of this debate, titled The Proofs of Prophecy (a‘lam al-nubuwwah), Razi answered all of Rhazes arguments and offered an important proof for Prophets in general and the Prophethood of Muhammad. As part of this argument, Razi explained how and why the Holy Qur’an was the miracle of Prophet Muhammad. To prove the Prophethood of Muhammad, Razi explained how the Qur’an is inimitable speech – because its eloquence (fasahah), literary arrangement (nazm), lucid expression (bayan) and rhetorical power (balaghah) exceed and transcend all the existing literary forms and conventions of the Arabic language, including normal speech, prose, metered poetry, rhyming prose, etc. Since no human being could produce any speech discourse that imitates the Qur’an, the Qur’an must be divinely-inspired and serves as proof that Muhammad is divinely-inspired; this is similar to how animals cannot replicate the speech-form of human language and discourse, thus proving that human beings possess a superior faculty of intellect, thought, and speech over animals. [read the full argument and evidence here]. Razi also wrote another famous work called The Book of Correction (kitab al-islah) where he engaged in a respectful debate with another Ismaili Da‘i over the concept of God, the structure of the Cosmos, and the missions of different Prophets. One important point that Razi makes in The Book of Correction is that: God cannot be described through any human concepts – one cannot even define God as “perfect” or “first cause” or “good” because God is the creator of goodness, perfection, and all causes and effects. Razi also taught a very interesting esoteric interpretation of the Prophet’s Mi‘raj (celestial ascent) – he said that the mythical horse “Buraq” on which the Prophet supposedly flew up the heavens actually means “illumination” (the word baraqa means “to shine”); this means that the Prophet ascended to the heaven of the Universal Intellect and Universal Soul through “illumination” (buraq). Ismaili sources report that Sijistani was the chief Da‘i or Hujjah of Khurasan. Sijistani was also among the first of a group of Persian Ismaili Da‘is known as “the Persian School of Philosophical Ismailism”, famous for integrating concepts from Neoplatonic philosophy with Ismaili religious wisdom – a school that includes Razi, Nasafi, Kirmani, Shirazi, and Nasir-i Khusraw. He wrote many important works including: The Book of Keys (kitab al-maqalid) which is on Ismaili philosophy, theology, cosmology, physics, and esoteric interpretation; The Book of the Boast (kitab al-iftikhar) which is a defense of Ismaili beliefs and practices against the attacks of Sunnis; The Book of Wellsprings (kitab al-yanabi‘) which is about the source of religious and natural knowledge for human beings and the cosmic order that God establishes for the guidance of humanity; The Proof of Prophethood (ithbat al-nubuwwa) which offers a series of arguments and proofs for the necessity and existence of Prophets in the world of humanity. One of Sijistani’s core teachings is the absolute transcendence, unity, and unknowability of God; while many theologians describe God using names like “the all-powerful” and “the all-knowing”, Sijistani explained that God, being infinite and the ultimate Originator of everything, cannot be described by these attributes; otherwise God would be multiple and not single. Thus, God is beyond space, time, matter, and motion and He is also beyond the categories of “thing”, “existence”, “substance”, and “cause”. Sijistani taught that the best way to speak of God is using negative language – by negating every positive quality from Him (i.e. God is not powerful) and also negating every negative quality (i.e. God is not not powerful). Another seminal teaching of Sijistani was about cosmology and cosmic hierarchy, meaning the structure and ordering of God’s creation; Unlike most Sunni Muslims, who believe that God is a spiritual being and the rest of creation is physical/bodily, Sijistani taught that God’s creation includes a spiritual realm and a physical realm, and that God is the creator and maintainer of both worlds. The spiritual realm consists of the Universal Intellect and Universal Soul [whose existence can be philosophically deduced even today], and a hierarchy of archangels called Jadd, Fath, and Khayal, while the physical realm is the realm of nature and bodies. Human beings are the manifestations of both worlds – through possessing intellect, soul, and physical body. These teachings were so influential that all subsequent Ismaili da‘is over the next thousand years adopted and taught these views. It thus becomes clear from this that the one who fits the definition of the Imamat is al-Ḥākim bi-amr Allāh, Commander of the Faithful, and none of the rest of those who claim it, and that obedience to him is incumbent on the community in its entirety. Therefore, we have fulfilled what we promised to do at the outset of the book, in accord with the grace of God and the excellent oversight of His Friend (wali) on His earth, on him be peace. Hamid al-Din al-Kirmani was considered the most learned Ismaili theologian of his time, and was a prominent scholar, accomplished philosopher, and prolific writer during the reign of Imam al-Hakim bi-Amr Allah (r. 996 – 1021). Although his origin is from the province of Kirman (southeast Iran), Kirmani’s main area of activity was Iraq – he was the Hujjah of the two Iraqs during this time. He then moved to Cairo, the capital of the Fatimid Empire where he was summoned to help revitalize the Ismaili Da‘wah and refute the extremist ideas of some of the dissident da’is who asserted that the Imam al-Hakim was the last Imam and God incarnate – a movement that later became the Druze religion. Kirmani wrote several important works – such as The Shining Lamps of the Proof of Imamat (al-masabih fi ithbat al-Imamah), which he wrote to convince the Buyid Wazir in Baghdad to accept the Fatimid Ismaili Imams. In this work, Kirmani offers proofs for the existence of God (reformulated here), the necessity of Prophethood (one argument presented here), the necessity of Imamat after Prophethood (reformulated here), and the proof of the Imamat of Imam al-Hakim bi-amr Allah (re-presented here). In another book, Kirmani answered and refuted certain objections and attacks against the Ismaili Imamat and Ismaili beliefs from Zaydi writers. Kirmani is also known for going back to the writings of the past Da‘is – Nasafi, Sijistani, and Razi – and providing new solutions to the issues they disagreed on. In doing so, Kirmani showed the utmost respect and courtesy for his fellow philosopher-Da‘is – referring to them as his “shaykhs” and correcting their ideas with great humility. Kirmani explained that each of the da‘is is like one of the senses of the body (taste, sight, hearing, etc.) – so if one da‘i comes to a conclusion differing from another da‘i, this is not an attack on the other da‘i, but simply a case where one bodily sense perceives what the others cannot. Kirmani emphasized the absolute transcendence of God above all realities and descriptions – like Ismaili da‘is before him and provided new arguments for this teaching; he also described the cosmic hierarchy of creation in terms of Ten Intellects – drawing on the work of the Muslim philosopher Abu Nasr al-Farabi. Kirmani’s last and greatest work was called Comfort of the Intellect (rahat al-‘aql) in which he explained the concept of the absolute unity of God, the process of cosmic creation, the spiritual, natural, and religious hierarchies (hudud), and the journey of the human soul toward perfection and becoming a pure intellect. Many works [that are] written on affirming the Imamat by the elders of the Daʿwah draw on deduction and evidence cited from well-known Qurʾanic verses revealed regarding the Imamat and the Imams, peace be upon them, in addition to traditions reported from the Prophet… Therefore, we wish to write a treatise on affirming the Imamat using evidence and deduction from the [outer] horizons and [our] inner selves, from politics or governance and norms by way of intellect (ʿaql), what is self-evident, innate constitution (al-fiṭra), natural disposition, and agreement from all religious communities as well as from philosophers (al-falāsifa) and mathematicians… if it is found to be reasonable, it is due to the excellence of spiritual support from the Master of the Age and the Time (walī al-ʿaṣr wa’l-zamān). He lived and worked as a da‘i in Fatimid Cairo during the reigns of Imam-Caliphs al-Aziz (365–386/975–996) and al-Hakim bi-Amr Allah (386–411/996–1021). His name (al-Naysaburi) suggests his origin is of Nishapur in modern day Iran. He was contemporary with fellow Da‘i and intellectual titan Kirmani and philosopher Avicenna or Ibn Sina (who came from an Ismaili family); the times in which they lived were tumultuous both within and without the Ismaili community. For instance, a group of Ismailis had become convinced of the literal divinity of the Imam al-Hakim (hotly refuted by Kirmani, Naysaburi, and the majority of the Fatimid Da‘wah) and later became known as the Druze. Naysaburi literally wrote the textbook on the ideal characteristics and duties of the Ismaili Da‘i, published as A Code of Conduct. His work was referenced and emulated by later luminary of the Ismaili Da‘wah, al-Shirazi, and was widely read both in his time and after. He also wrote a book history of the concealed Imams between Imam Muhammad b. Isma‘il and Imam al-Mahdi called The Imam’s Concealment and the Dispersal of Daʿis in Search of him to Different ‘Islands’ (kitab istitar al-imam wa tafarruq al-duʿat fiʾl-jaza’ir li-ṭalabi-hi). The successes of the Fatimids was met with a frightened backlash by the Sunni Caliph based in Baghdad who decided to try to undermine their claims of legitimacy by publicly attacking their genealogy with lies. In response to these dual attacks from Sunni scholars and propagandists, Kirmani and Naysaburi rose up and defended the Imam and the community, writing numerous treatises and fighting with the power of their pen. He wrote theological texts such as The Book of Divine Unity (kitab al-tawhid) and The Proof of Imamat (kitab ithbat al-imamah); this latter book, published as Degrees of Excellence, not only proved the Imamat through Qur’anic and Hadith references but also used innovative philosophical arguments. This book also expounded on the Ismaili belief that there has always been an Imam and even shows Qur’anic evidence of the line of Imamat from the time of Adam. O towering mountain of knowledge, incapacitating the aspiring climber. in the West, O companion, and in the East. and be for them the concerned father. you have surpassed the compass of the earlier [da‘is]. Al-Mu’ayyad al-Shirazi was born in 996 or 997 with the name Abu Nasr Hibat Allah b. Abi ‘Imran Musa b. Da’ud but is more commonly known for the title he received during his appointment as the Da‘i of Fars: al-Mu’ayyad fi al-Din (the recipient of ta’yid in religion). Born and raised in the city of Shiraz in the province of Fars in southwest Persia, he is often called al-Shirazi, meaning “from Shiraz”. His ancestors served the Ismaili Imams even when they were in concealment prior to the advent of the Fatimid Caliphate. Surrounded by hostile Sunni and Buyid forces in Shiraz, Shirazi was forced to operate in “semi-secrecy”. Nevertheless he attracted an impressive following and converted many people to Ismailism – including, for a time, the Buyid Sultan of Shiraz, Abu Kalijar, himself. Shirazi ruffled many feathers in Sunni-dominated Shiraz for example when he openly held Ismaili ‘Id celebrations on the mathematically calculated date rather than the Sunni method of sighting the new moon. Sunni crowds also demanded his head when Shirazi renovated a mosque and offered the Friday sermon in the name of the Ismaili Imam. All of this led to Shirazi’s seven-month-long house arrest and eventual banishment from Shiraz. He had to flee in the night in disguise and journey refuge in Fatimid Cairo – the center of the Da‘wah. Almost immediately following his arrival Shiraz noticed that the Da‘wah and administration were crawling with politicians and venal power players. Drawn to the power of the radiant Imam-Caliph, the positions of authority were all taken by incompetent oily bureaucrats whose motivations he questioned. One example was how the administrative roles of Chief Da‘i (da‘i al-du‘at) and Chief Judge (qadi al-qudat) was al-Qasim, great grandson of Chief Da‘i Qadi al-Numan. Although his ancestor was illustrious, Shirazi was very disappointed as he found him inferior and unqualified. Al-Qasim, on the other hand, was very threatened by the intellectual titan Shirazi and did not make things easy for his potential rival. After more than a year of pleading and trying to get past the bureaucratic and institutional red-tape, Shirazi finally achieved the Didar of the Imam, whom he and his ancestors had served so faithfully. Shirazi’s description of his first Didar is truly touching. When the position of Chief Da‘i [an administrative position like ITREB Chair] became vacant, Shirazi was certain he would be a shoe-in, however, the Fatimid bureaucrats closed ranks and the position for which no one was better qualified was denied to him – instead the new Fatimid vizier, al-Yazuri (a Sunni Muslim!) became Chief Da‘i; he would take on the role of delivering the weekly Majlis al-Hikmah sermon to educate the Ismailis on their faith. However, because al-Yazuri did not actually know anything about Ismaili thought, Shirazi was given the lowly and demeaning position of ghost-writer of all al-Yazuri’s Sermons. Al-Yazuri admitted to his own relatives that he had mistreated Shirazi not because of any lacking credentials but because of his own personal dislike of the man. Now aged more than fifty years, Shirazi was astonished when al-Yazuri sent him on a military mission to Syria. Amazingly Shirazi succeeded in brokering an alliance of disparate parties and ultimately due to his leadership Fatimid forces marched into the heart of Abbasid power: Baghdad. The Khutbah in Baghdad was delivered in the name of Fatimid Imam al-Mustansir for a year. When Shirazi returned to Cairo – victorious – there was no celebration and no acknowledgement of his enormous deed. In 1058, twelve years after his hopeful entry into Cairo, al-Yazuri was imprisoned on charges of embezzlement and Shirazi was finally appointed the Chief Da‘i of the Da‘wah and – beyond that – the Imam also revealed his spiritual status, declaring him as his Bab. Despite his enormous achievements and the publicly declared love of the Imam, Shirazi was never free of his politicking peers. For political reasons, he was removed from Chief Da‘i-ship and exiled from 1061-1062 (the excuse this time was a supposed stutter), but was later reinstated by the Imam. Shirazi left behind an extensive and profound corpus including an autobiography (sira), a Diwan (book of poetry), a Persian translation of one of Qadi al-Num‘an’s Arabic works, and most importantly his al-Majalis al-Mu’ayyadiyyah, composed of 800 of his sermons full of Qur’anic ta’wil and Ismaili theology. Additionally, the writings of Nasir-i Khusraw, who was Shirazi’s student, are full of praise for him. When I arrived in this land [of Khurasan] from the holy and prophetic presence with a command from the true Imam, the offspring of the chosen Emissary, and the inheritor of his ancestor’s exalted rank, the keeper of his sagacious wisdom – Ma‘add Abu Tamim [al-Mustansir billah], the Imam, the Commander of the Faithful – I had already made a study of the writings of the masters of philosophy, and I had a sound grasp of the science of true religion, including that very science of esoteric interpretation (ta’wil) which holds the inner meaning of the Book of the Sacred Law (shari’ah). Nasir-i Khusraw was born in 1004 to a non-Ismaili family in the small town of Qubadiyan in the Balkh district of the Khurasan province (modern day Afghanistan). He spent the first 40 years of his life living a life of pleasure (women, wine, travel, poetry) after receiving a good education; he worked a revenue clerk in the Ghaznavid court and later the Saljuqs. At around the age of 40, Nasir-i Khusraw had a spiritual awakening – either from a powerful dream or through meeting an Ismaili Da‘i – he renounced his way of life, quit drinking wine, and set off on a 7 year journey to find ultimate truth. Nasir journeyed to Cairo, where he met the great Ismaili Bab al-Mu’ayyad al-Shirazi and received spiritual and intellectual instruction directly from this Bab of the Imam. After about six years, Nasir-i Khusraw was appointed by the Imam al-Mustansir billah to the rank of Hujjah of the Khurasan region and returned to his hometown to conduct the Ismaili Summons. Back in Balkh, the Sunni scholars persecuted Nasir-i Khusraw, burned down his home, and attempted to kill him; he fled and found refuge in the mountain region of Yumgan (in Tajikistan) where an Ismaili prince protected him; living in exile, Nasir-i Khusraw wrote tens of thousands of lines of poetry and composed several writings on Ismaili philosophy, theology, and ta’wil. In one famous book called The Face of Religion (wajh-i din), Nasir explained the inner meaning of all of the laws and rituals of Islam, including the ta’wil of exoteric salat, the ta’wil of Hajj, the ta’wil of fasting, and the ta’wil of ablutions. In the book Provision for the Travelers (zad al-musafir), Nasir presented a sophisticated proof for the existence of one God and a new Ismaili arguments for the necessity and existence of prophethood based on the structure of the Cosmos. Nasir-i Khusraw’s teachings aimed at showing the intellectual basis and philosophical meaning behind religious beliefs and practices – so the title of his final book was called The Reconciliation of the Two Wisdoms (jami‘ al-hikmatayn) – which was about showing how Greek philosophy and Islamic religion are based on the same esoteric truths taught by the Ismaili Da‘wah. Following his death, Nasir-i Khusraw came to be revered and cherished by both Sunni and Ismaili Muslims. The Sunnis built a shrine for Nasir-i Khusraw at the place where he supposedly lived – this shrine was restored by Aga Khan Trust for Culture; Nasir’s poetry is famous all over the Persian world including Central Asia; his life story has become the stuff of legend among the Muslims of Central Asia, for whom Nasir-i Khusraw is the patron saint whose blessings protect the entire region. In 469/1078, Hasan-i Sabbah the Ismaili visited [Imam] al-Mustansir dressed as a merchant and discussed setting up a Da‘wah in Khurasan and the ‘Ajam. This was permitted and Hasan swiftly returned and implemented it. Hasan asked al-Mustansir, “Who will be my Imam after you?” The reply was “My son Nizar.” The Nizari Ismailis thus believed in Nizar’s Imamat and behaved according to what they thought was the will of Allah in 487/1094. Hasan-i Sabbah was born to a Twelver Shi‘a family from the Persian province of Rayy. During this time, Rayy was a major centre of the Ismaili Da‘wah. When Hasan was a teenager, he was introduced to Ismaili teachings by Amira Zarrab, the local Ismaili Da‘i, and then continued learning from more Ismaili da‘is of Rayy like Abu Nasr Sarraj. At the age of 17, Hasan-i Sabbah converted to Ismaili Islam and gave his bay‘ah to Imam al-Mustansir billah. In 1072, the chief Ismail da‘i of the region, ‘Abd al-Malik b. ‘Attash appointed Hasan as a da‘i due to his great impression and Hasan moved to Isfahan – the base of the Ismaili Da‘wah in Persia to conduct the summons. In 1077, Hasan was sent to Cairo and he arrived in 1078; by this time al-Mu’ayyad al-Shirazi had died and the Fatimid government and army had been taken over the Badr al-Jamali and his son Afdal al-Jamali; the Imam al-Mustansir billah no longer had control of the Fatimid state. It is reported by Ibn Athir that Hasan met Imam al-Mustansir in person, where the Imam informed Hasan that the next Imam was to be his son, Mawlana Nizar, and commanded him to carry out the Ismaili da‘wah in Persia. Due to this reason, Hasan fell into conflict with the Jamalis, who planned to interfere in the Imamat Succession of Mawlana Nizar. Hasan was banished from Egypt by Badr al-Jamali; he travelled extensively to find a safe haven for the Ismaili Imamat, given what he experienced and saw in Cairo. Eventually, Hasan-i Sabbah managed to take over the fort of Alamut – by covertly converting its youth population to Ismaili Islam without the owner even knowing, until it was too late. When Imam al-Mustansir died, Hasan-i Sabbah supported the Imamat of Nizar – the Imam’s officially appointed successor – and combated the political and religious propaganda of Afdal al-Jamali who placed another son Must‘ali on the Fatmid throne; this conflict became very bloody as Imam Nizar was killed, and Hasan-i Sabbah arranged for Nizar’s progeny to be safely brought out of Egypt to Alamut – effectively saving the Nizari Ismaili Imamat from being wiped out. At the same time, Hasan sent Ismaili Fida‘is to Cairo to support Imam Nizar’s cause and cause trouble for al-Afdal’s rule. Hasan-i Sabbah is also famous for creating a new intellectual argument to prove the Imamat of the Imam: this argument was called Ta‘lim and it employed purely rational proofs for the necessity, existence, and identity of the Ismaili Imam as the infallible guide and bearer of Truth, who provides ta‘lim (authoritative instruction) to human beings so they may attain the gnosis of God [a modern day adaptation of Hasan’s argument for Prophets and Imams is here]. This argument was so influential that it threw the entire Sunni scholarly and religious establishment into chaos: Al-Ghazali was commissioned by the Abbasid Caliph to write refutations and responses to Hasan’s argument and Ismaili teachings in general. In fact, al-Ghazali’s own writings show that he himself adopted the concept of Ta‘lim and integrated it into a Sunni framework – admitting that Prophet Muhammad was the infallible guide in his own time. The study of the noble words from the Ahl al-Bayt and their friends disclosed to me the hidden secrets and firm principles in the science of the Qur’ān. So I searched for ‘the truthful’ as passionate lovers might search. And I found one of the virtuous servants of God, just like Moses with his young man… So I learnt from him the ways of the creation (khalq) and of the Command (amr), the degrees of contrariety and hierarchy, the twin aspects of generality and specificity, and the two rulings of the accomplished and the inchoative. I thus had my fill of this single dish, not the dishes which are the foods of error and the starting points of the ignorant. He was born in 1086 in the town of Shahristan in the Khurasan province of Persia. He studied in Nishapur, the centre of Sunni theology where al-Ghazali had studied, and learned from the disciples of the Sunni master al-Juwayni. He then studied in Baghdad at the famous Nizamiyya madrasa. At some point, Shahrastani encountered Hasan-i Sabbah and was persuaded by Hasan’s Ta‘lim argument on the necessity and existence of the Imam of the Time as the infallible teacher and bearer of Truth — but Hasan-i Sabbah’s party evidently refused to teach Shahrastani, which greatly annoyed him. But Shahrastani was also able to learn about Ismaili philosophical and esoteric teachings from certain Ismaili texts and possibly through an unknown Ismaili da‘i. Having become educated in Ismaili theology, philosophy and esoteric wisdom, Shahrastani practiced taqiyyah for his entire life — he was publicly known as a respected Sunni theologian of Ash‘ari theology; however, Shahrastani was able to insert Ismaili ideas and interpretations into his writings. He is famous for writing The Book of Sects and Creeds (kitab al-milal wa l-nihal), where he explains the religious beliefs of all major Muslim and non-Muslim religious groups known at that time. In this volume, Shahrastani devoted a special discussion to the Fatimid Ismailis and the Nizari Ismailis, where he presented very accurate information. Shahrastani also wrote a philosophical work called Struggling with the Philosopher (kitab al-musar’aa) arguing against Ibn Sina’s concept of God as the Necessary Existent – accusing Ibn Sina of reducing God to the level of “existence” whereas God must be beyond existence and non-existence. In this work, Shahrastani employed Ismaili philosophy and theology in a most impressive and thorough way. Shahrastani’s last and most important writing was his esoteric commentary of the Qur’an called Keys to Arcana and Lamps of the Righteous (mafatih al-asrar wa-masabih al-abrar) – where he provides the ta’wil (esoteric interpretation) of Surah 1 and 2 of the Qur’an based on Ismaili Muslim principles. Most interestingly, Shahrastani begin the commentary by saying that he came to know the inner meaning of the Qur’an by a spiritual guidance within his heart – indicating that he received inspiration (ta’yid) from the Imam like the Hujjahs. The core teachings of Shahrastani – that the Qur’an and the Prophet are the mazhar (locus of manifestation) of God’s Word or Command, the distinction between God as Creator of all creatures and God as Mawla (Lord-Guardian) of the believers, the importance of the Lord of Resurrection who perfects the Shari‘ah by abrogating it, and the role of angels mediating between the intellectual spiritual world and the physical world – had a profound impact upon the Nizari Ismaili teachings in Alamut through Nasir al-Din al-Tusi. Writing a hundred years later, Tusi referred to Shahrastani as the “Da‘i of the Da‘is” (da‘i al-du‘at). Mawlana Hazar Imam has made an important allusion (isharah) to the importance of Shahrastani, when he named one of his racehorses “Shahrastani”. According to ta’wil (esoteric interpretation), Nasir-i Khusraw once wrote that the “horses” stand for Hujjahs and their forelocks stand for Da‘is. is careless and not mindful of me when the Imam is mindful and caring. the lord of the age, Muhammad b. Hasan, on whose mention be peace. of religion and the world, a rank and a sanctuary to enjoy. Not much is known about Hasan except that he lived at Alamut and was contemporary with four Nizari Ismaili Imams – Mawlana Hasan ‘ala-dhikrihi al-salam, Mawlana Nur al-Din ‘Ala Muhammad, Mawlana Jalal al-Din al-Hasan, and Mawlana ‘Ala al-Din Muhammad. Hasan-i Mahmud is very important because he was an eyewitness to the Imam’s Declaration of Qiyamah in 1164, when the Imam abolished certain structures of the Shari‘ah and ended taqiyyah for the Nizari Ismailis. He wrote an important treatise, called Haft Bab-i Baba Sayyidna, a treatise explaining the concept of Qiyamah and the Imamat of Mawlana Hasan ‘ala-dhrikihi al-salam. This was written 60 years after the Qiyamah and represents the earliest available source for the event. With Nasir al-Din Tusi, Hasan helped write the major Nizari text The Paradise of Submission (rawda-yi taslim), which is a compendium of Nizari Ismaili philosophy, theology, and spirituality. I happened to see a copy, in mediocre handwriting and antiquated paper, of the Fusul-i Muqaddas (Farmans) of Imam ‘Ala Dhikrihi al-Salam, in the possession of an unworthy person who did not know what it was. Obtaining [the text] with a ruse, I occupied myself day and night with reading it, and the extent of my humble understanding and ability, I gained endless benefits from those sacred words which are the light of hearts and the illuminator of inner thoughts. It opened a little of my eye of exploration and my inner sight was unveiled. Nasir al-Din al-Tusi was born to a Twelver Shi‘a family and grew up in Nishapur; however, his father used to hint to him that the Ismaili path was the most correct interpretation of Islam and made sure Tusi was educated by students of al-Shahrastani who had Ismaili leanings. Tusi reported in his autobiography, Contemplation and Action (Sayr wa Suluk) that he studied Islamic law, kalam theology, and peripatetic philosophy (falsafa) but did not find intellectual certainty in these sciences; one day [see above] he found a copy of the Farmans of Imam Hasan ‘ala-dhikrihi al-salam in the possession of someone who did not value them. Tusi admitted that he “obtained it with a ruse”, i.e. stole them, and began reading them. After reading the Farmans of the Imam, Tusi began to find the spiritual certainty he was seeking and started learning more about the Nizari Ismaili theological and philosophical teachings; eventually he became convinced by Hasan-i Sabbah’s Ta‘lim argument and entered the Ismaili da‘wah as a Mustajib. Tusi stayed with the Ismailis for three decades – first in Quhistan and then in Alamut. During this time, he wrote his greatest scientific, philosophical and esoteric works – including his Nasirean Ethics, his Commentary on Ibn Sina’s writings, and several Ismaili treatises such as The Paradise of Submission (Rawda-yi Taslim), which Tusi wrote with Hasan-i Mahmud’s collaboration. For his services, Tusi was given the title of “Sultan of the Da‘is” (Sultan al-Du‘at). Many of Tusi’s teachings and words are quoted in Nizari Ismaili literature of the next few centuries. When the Mongols invaded Persia and engaged the Nizari Ismaili state in war, Tusi was part of the Ismaili negotiating team and one of the advisors to the Imam Rukn al-Din Khurshah. After the surrender of the Ismailis and the massacre of the Imam, his family, and tens of thousands of Nizari Ismailis by the Mongols, Tusi was able to save his life by practicing taqiyyah and claiming that he was a Twelver Shi‘a. Tusi’s tactics paid off: the Mongol leader Hulagu Khan appointed Tusi as his advisor and patronized him, even building him an observatory. In his later years, Tusi lived his life outwardly as a Twelver Shi‘a, but continued writing on many subjects such as Imamat and Sufism. Today there continues to be a debate about Tusi’s religious affiliation – whether he was Ismaili, Avicennian, Twelver, or Sufi, or a combination of all of these. Recent evidence from Tusi’s later works shows that Tusi actually remained Nizari Ismaili in his religious conviction despite outwardly appearing as Twelver: Tusi continued to hold and expound Ismaili Muslim views on the absolute transcendence of God instead of Twelver or Sufi positions; he also seems to have described and praised the Ismaili Imams in the most venerating language in one of his letters to the Sufi thinker Sadr al-Din al-Qunawi, where he mysteriously refers to a person who is “the great Imam, the pole of God’s friends, the caliph of the Prophets, the inviter to Truth, the guidance of creation”; even in his Twelver works, Tusi seems to speak favourably of the Ismaili concept of Imamat over the Twelver view. After Tusi’s death, his descendants in the village of Sidih, near Birjand, continued to be venerated by the Persian Ismailis, as reported by Imam Aga Ali Shah. Be united in following the teaching of a person appointed by the designation of God and his Friend [the Imam] and unify your passions in obeying him. Accept willingly whatever commands and prohibitions he vouchsafes to you. No, by the Lord of the Worlds, you do not believe until you make him judge in your tangles, and do not afterwards find difficulty in his decisions but assent to them heartily. And this uniting is the unity which is the sign of truth that saves from destruction and leads to everlasting felicity, since disagreement is the sign of falsehood, which leads to shameful perdition. In the 12th century, the Syrian Nizari Ismailis lived amidst many hostile parties – including Sunni Muslims and Crusaders, who had been making repeated invasions of the area in the name of Jesus Christ. The Ismailis in Aleppo and Damascus had been under the protection of local emirs – until 1128 when the emir of Damascus passed away. Immediately, the Sunni preachers and mobs targeted the Ismaili community of the city – leading to the mass slaughter of over 10,000 Ismaili murids, with many being crucified on the city gates. Such events caused the remaining Ismailis to relocate to the mountains and live in fortresses – including Qadmus, Masyaf, al-Khawabi, Rusafa, and Kahf. Sinan was born a non-Ismaili in Basra in 1133. He was known to be lame in one leg but very personable, gentle, honorable, and well-loved. The history we know shows his military and diplomatic genius but he was the quintessential well-rounded Da‘i – proficient as he was in theology, philosophy, astronomy, and other religious sciences – who would have made Naysaburi proud. After his conversion to Ismailism he was trained as a Da‘i in Alamut where he became close to his classmate, the Ismaili Imam Hasan ‘ala-dhikrihi al-salām. The Imam sent his trusted classmate to Syria where he would take the community under his protection. Very quickly, under his guidance, Sinan stopped the infighting between Ismaili factions and trained Fida‘is who would be critical to his military strategy at protecting the Syrian Ismaili position. He also worked on the infrastructure, procuring strongholds and fortifying those they had. Communication between fortresses in this hostile environment was done with pigeons and using secret codes. Sinan’s relationship with the fearsome and notorious Ayyubid Caliph Salah al-Din (known in the West as Saladin) exemplifies the respect he earned from the power players of his time and how he was able to use every means to protect the Syrian Ismailis not just of his time but for generations. Saladin was the Kurdish general who defeated the Shia Fatimids and took over their lands to form his own Sunni Ayyubid empire. One of the best-known Muslim leaders in all of Islamic history, his leadership saw the beginning of the end of the Crusades as he took back Jerusalem. Ambitious and astute, Saladin tried to rule all of Islam under his Sunni banner and he certainly saw Sinan as a threat to his goal. In 1176 Saladin attacked the Ismailis and overran the small community with his far superior forces. Then he turned his eye to Masyaf where Sinan was located. No one knows what Sinan and his Fida‘is did – but only days after his siege of Masyaf had begun – Saladin ended it and did not return. After this event Saladin, the lion of Sunni Islam, not only ceased his attack on Ismailis but became Sinan’s ally. There are also reports of Fida‘is being sent to help Saladin fight Crusader forces including some suspected high profile assassinations. There are other reports of Crusaders imprisoned for Saladin at Ismaili fortresses; so when Saladin negotiated peace with English King Richard the Lion-Hearted, he made sure to safeguard Ismaili lands in the treaty. When Sinan died in 1193 he was entombed at the Syrian Ismaili fortress of Kahf. He could have died peacefully, knowing that he had served his Imam and protected the Imam’s followers for centuries. His relationship with Saladin and the Ayyubids outlasted their lifetimes as the later Ayyubid Caliphs respected the boundaries of the Ismaili lands and even continued to ally with them against the Crusaders. Local Sunnis also respected their autonomy despite their differences of faith. Sinan’s tradition of allying with disparate forces also continued and sometimes the Ismailis found themselves fighting alongside some Crusaders against others. Interestingly, some historians note that some of the Knights Templars were influenced by Ismaili philosophy – still taught even at this most sensitive and trying time of conflict. There is speculation that some of the esoteric elements in the traditions of the Knights Templar may have come from an Ismaili influence and were brought back to Europe. You stand behind anyone who winds a turban around his head and steps before you, thinking, ‘this is the Imam.’ Not for an instant is the world bereft of the Imam of the time! Does what I say bother you? Well, what can I do about it if the Qur’an says so? As the Imam was and always will be, what would you respond to me if I were to ask, ‘Who is your Imam?’ If you do not know the Imam of your time with certitude, then know certainly that your wealth, wife, even the head upon your shoulders, all are forbidden to you. Nizari Quhistani was 10 years old when the Mongols massacred tens of thousands of Nizari Ismailis in Persia; Nizari grew up in Khurasan during a time when Ismailis in Persia lived in fear of their lives. As a youth, Nizari learned poetry very easily, mastering Arabic and Persian classical styles. He then went on to become a tax collector and court poet. During this time Nizari had to conceal his Ismaili identity. He then undertook a journey of several years, apparently in search of the Imam of the Time who was Imam Shams al-Din Muhammad living under disguise. Nizari wrote a great deal of poetry about his travels and about his faith, often speaking about his Ismaili beliefs and activities using cryptic Sufi images – like lover/beloved, wine cups, khanaqahs, cloaks, etc. Guru Shams, the Pir, went to roam. The Pir is the person to whom the Imam of the time has granted his position, which makes him the highest amongst the creations (ashraf-i makhluqat). And whenever he (the Imam) has chosen the Pir, and appointed him, he (the Pir) must convey to others the knowledge in detail (ma‘rifat-ra ba-tafsil). You must attain perfection in knowledge of the Imam through him. But if he has not appointed a Pir, you must come to know some person amongst the possessors of knowledge (sahiban-i ‘ilm) whom he has commissioned to guide and summon the people (ba-dalalat wa da‘wat) so that you may through the guidance and summons of such a person (irshad wa da‘wat) attain the recognition of the Imam (ma‘rifat-i Imam). Thus you will not remain in wretchedness, attaining through the illumination of his knowledge (rawshana’i-y-i ilm-i u) the recognition of the Imam. And whenever there is a Pir, the teachers will take up summons (da‘wat), by his permission, remaining under his control and order. Since the time of Prophet Muhammad, there have been 50 Pirs – Prophet Muhammad was the first Pir and Mawlana Hazar Imam is the fiftieth and current Pir. All the Pirs were directly descended from an Ismaili Imam. The Ismaili Imam guides the general Jamat through his Pir – even when the Imam himself plays the role of Pir like today. Among the 50 Pirs since Prophet Muhammad, a number Pirs were renowned for leading the Ismaili Da‘wah in South Asia through composing the Ginans – which are the Pirs’ teachings of ta’wil and ma‘rifah through the inspiration (nurani ta’yid) of the Imam. These include Pir Satgur Nur, Pir Shams, Pir Nasir al-Din, Pir Shihab al-Din, Pir Sadr al-Din, Pir Hasan Kabir al-Din, and Pir Taj al-Din. There were also Hujjahs and Da‘is from the progeny of Pir Hasan Kabir al-Din including Sayyid Imam Shah, Sayyid Dadu, Sayyid Nur Muhammad Shah, and others, who came to instruct and guide the South Asian Ismailis such as the Shamsis, Khojahs, and Mumnas. The family of Pirs claimed descent from Isma‘il b. Ja’far, but through a line different from that of the Imams, and provided the most gifted and dedicated exponents of Ismailism in South Asia. The leaders of the community seem to have continuously been appointed from their ranks. Their activities are alluded to in a contemporary Iranian source, the anonymous treatise entitled Epistle of the Right Path. Describing how the Imams from ‘Ali through Isma‘il were manifest (zahir) while those from Isma‘il through Mahdi were concealed (mastur), it continues: Mawlana Isma’il manifested in the cities of Uch and Multan, leaving indications among the people of India and displaying marvels. A community from among that Imam’s descendants still remains in that realm, and by means of those indications those people will never entertain doubts. The da‘i must see to the affairs of the da‘wah and its proper administration, thereby relieving the Imam of that obligation, for the Imam has appointed him to manage the da‘wah and maintain the welfare of various regions… Thus the da‘i is responsible for its repair and the amelioration of all corruption, trouble, the perversion of doctrine, doubt about religion, going astray, insurrection and rebellion that happens in the da‘wah… When God questions the Imam about things connected to the affairs of his community and his safeguarding and care for them, the Imam will ask him [the da‘i], for the Imam made that his responsibility. Today, the formal or official Ismaili Da‘wah with its teaching hierarchy is no longer in operation. The formal Ismaili D‘wah was abolished by Imam Sultan Muhammad Shah. The abolishment of the Da‘wah and its hierarchy was foretold one thousand years ago by Hamid al-Din al-Kirmani, Nasir-i Khusraw, al-Mu’ayyad al-Shirazi, and other Ismaili da‘is. It was said that when the formal Da‘wah is abolished, the Cycle of Age of Resurrection (qiyama) will begin, in which the Imam is more directly accessible to his murids and humankind in general than ever before. In this situation, the Imam is like the Sun and the Ismaili Babs, Hujjahs, and Da‘is are like the Moon and the Stars and constellations: the Imam’s spiritual radiance and guidance overshadows the knowledge and guidance of the da‘is just as the Sun’s bright light illuminates the sky and conceals the lights of the moon and stars. During the time when the Imam of the Time manifests himself, this community of adepts [i.e. Babs, Hujjahs, Da‘is, Ma’dhuns] are concealed like the stars at the moment of sunrise; they only reveal themselves during a period of concealment. Every Ismaili murid is at a different rank of knowledge (‘ilm) and gnosis (ma‘rifah). The spiritual responsibility of each murid is to raise up the person who is below him to his own rank in knowledge. This is stated by Imam al-Mu‘izz as follows: “The true believer is a true believer only when he has raised up a true believer like unto himself” (Henry Corbin, Cyclical Times and Ismaili Gnosis, 138). Historically, the Ismaili da‘is had the duty of instructing and teaching Ismaili theology, philosophy, wisdom, and esoteric interpretation to other Ismailis and also assisting them materially; the Imam rarely performed these tasks himself, but delegated it to his Hujjahs and Da‘is. Today, this same work continues in a different form, as the Imam has commanded every murid to use their intellect to understand and practice their faith and share their religious knowledge with others. Furthermore, some murids have expressed their intention to symbolically perform work similar to the Ismaili da‘is of the past – such as dedicating their life in service to the Imam like the Imam’s servants and entourage, sacrificing their life for the Imam’s cause similar to past Da‘is and Fida‘is, and performing hidden but important services for the Imam just as the Hujjahs did so through the Imam’s luminous inspiration (nurani ta’yid). Symbolically speaking, the souls of all murids of the Imam are spiritually connected like the leaves, branches, and roots of a tree illuminated by the Light of the Imam. In the world of reality, everything is connected, from the true Imam, who is like the heaven, down to the weak Mustajib, who is like the smallest particles of earth, so that nothing is left out of the system… The Messenger of God said: “We are from the Light (nur) of God and our Shi‘a are from us, akin to a blessed tree which has its own roots, branches, and leaves like every tree.” The meaning of this tradition is that every believer (mu‘min) who pledges the covenant (‘ahd) to the Imam of the Time is one of the [spiritual] descendants of the Prophet and is from the Light (nur) of God. His return is to that [nurani] tree because he has become one of its leaves. Thus, a small number of intellectually and spiritually gifted Ismailis, sometimes working various fields including Jamati institutions, AKDN institutions, Ismaili civil society organizations, academia, and informal and discrete settings, continue to perform the same roles and work as the historical Ismaili da‘is – such as establishing the proof of the Imamat, helping murids better recognize the Imam, and safeguarding their quality of life — but without their teachings being authoritative as was the case in the past. Imam Ja‘far al-Sadiq says to all his non-da‘i Shi‘as: “Be our silent da‘is.” He made his remarks clear by pointing out to them that if they lived a straight life they would attract the people to their faith and thus they would prove to be the da‘is not by means of their tongue but by means of their deeds. According to the hadith of the Prophet Muhammad, “Blessed is the one who saw me, and blessed is the one who saw the one who saw me” (al-Mu’ayyad al-Shirazi, al-Majalis a-Mu’ayyadiyyah). The meaning of this hadith is that the Ismaili murid who has didar (beatific vision) of the Imam can transmit and share the blessings of the didar with other murids — when others simply look into that murid’s eyes. This used to be a pre-modern practice – where one or two people in a village journeyed to see the Imam and when they returned, other Ismailis would look into their eyes and attain the didar through them. This practice of a murid having the Imam’s didar through another murid is practiced daily during the Shah-jo-didar ritual. In this respect, a murid who conveys the Imam’s didar, blessings and guidance to other murids is acting as an Ismaili da‘i in this role. Murids who perform the Ismaili Du‘a with understanding – reciting it with awareness of its real meaning – are symbolically performing the essential role of the Ismaili Da‘i. This is because the entirety of the Ismaili Du‘a’ summarizes, expresses, embodies and symbolizes the principles and stages of the Ismaili Da‘wah. The Du‘a’ enacts the entire spiritual journey of a murid through the Ismaili Tariqah of Islam, from the beginning to the end. Indeed, the words du‘a’, da‘wah, da‘i all come from the same Arabic root (dal-‘ayn-waw) which means to summon, to invite, to call, etc. In the First Part, the worshipper recognizes the Attributes of God such as Mercy, Compassion, Lordship and Sovereignty and enters into the worship (‘ibadah) of God. In the Second Part, after affirming the need to worship God, the worshipper recognizes that God has established a manifest Imam as the possessor of authority (ulu l-amr) and that worship can only take place by means of obedience (ta’ah) to God, the Prophet, and the Imams. In the Third Part, the worshiper recognizes the identity of the Imam by means of the declaration (tabligh) of divine designation (nass) of the Imam – which was publicly declared by Prophet Muhammad at Ghadir al-Khum. In the Fourth Part, after discovering the identity of the Imam, the worshipper pledges a covenant (mithaq) with the Imam through the act of bay‘ah and becomes a murid and a spiritual child of the Imam. In the Fifth Part, the murid affirms to stand by his bay‘ah and fulfill the trusts (amanat) of the Imam. During the silent dhikr of Ya Ali Ya Muhammad in the midst of the Fifth Part, the murid contemplates and attains the recognition (ma‘rifah) of the Imam and his Bab. The end of this special dhikr – beginning with the exclamation of Ya Imam al-Zaman (O’ Imam of the Time) – represents the moment (waqt) of the recognition (ma‘rifah) of the Imam followed by a declaration of the true reality (haqiqah) of the Imam. In the Sixth Part, after having recognized the Imam in his reality, the murid attains the recognition (ma‘rifah) of tawhid – the absolute oneness of God – represented by Surat al-Ikhlas. The Ismaili Du‘a’ encompasses the stages of the Ismaili Da‘wah. This Ismaili Du‘a’ is a practical or embodied form of the Imam’s “Summons” (Da‘wah) to his murids as it summarizes the essence of the Ismaili Tariqah of Islam. To practice this Du‘a’ is to respond to this Da‘wah and symbolically journey through all its stages. So whenever an Ismaili murid recites the Ismaili Du‘a’ with true understanding, he or she symbolically becomes a Da‘i and his Du‘a’ is actually a “summons” (Da‘wah) to the recognition of the unity of God (tawhid) through the Imam of the Time. This is your Magnum Opus IG!! You take a range of very difficult to understand subjects, amalgamate them in a more simplified way to create a pathway for the ordinary murid to intellectually grasp the rich history of intellectual missionary proselytizing encompassing the 1400-year span of Shia Ismaili Islam. Bravo! !